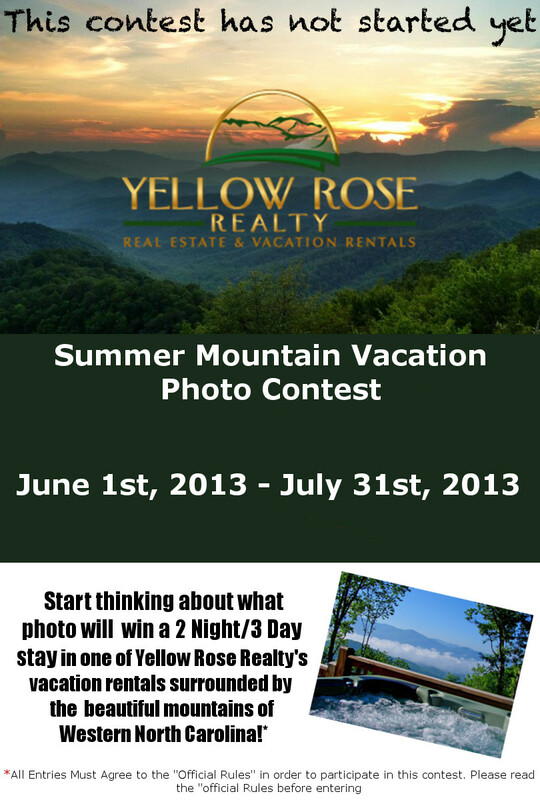 The Yellow Rose Realty “Summer Mountain Vacation Photo Contest” starts on June 1st and we are excited to see all of the great photos that are going to be submitted! We love the mountains and we love to see the beauty and fun experienced here by all that visit, and that is what this contest is about, we want to see what you love about the mountains while showing off your photography skills. Once you enter a photo you need to get your friends to vote, and if you find another photo that you think is better than enter it the next day if you want. You will be able to enter one photo per day and vote once per day. 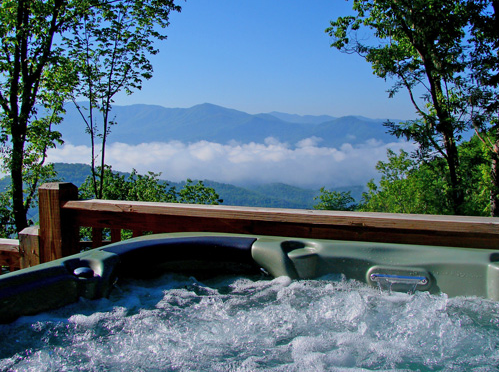 The prize is a 3 Day/2 Night stay in one of Yellow Rose Realty’s mountain cabins! To whoever wins this may be their second trip to the mountains in one year or maybe they were not able to come this year so they submit a photo from a previous year and win, now they get to come to the mountains! This is an awesome prize and we are excited to be able to offer it to all of our great fans! 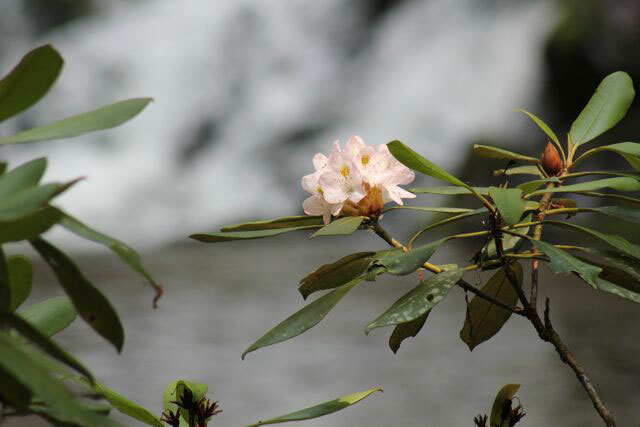 The photos can be of anything in Western North Carolina that you think can win the most votes, however it needs to be “G” rated, from your vacation in the mountains, and from the summer months. Save you awesome fall photos for another photo contest later on in the year. These are the basics of the contest, all the contest details are located in the “terms and conditions” section of the contest entry form. The contest can be accessed through our Facebook page (Yellow Rose Realty) or at this link (http://woobox.com/qopusg), so get those photos ready to submit and then make sure you inform your friends to vote! 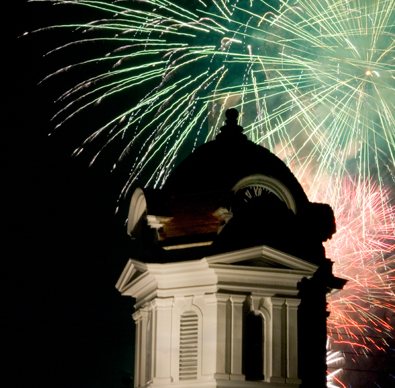 Western North Carolina is a great place to visit in Spring and below we have listed just a few of the events that are going to be happening in March 2013. 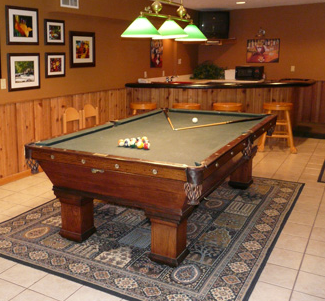 There are also links to our cabins that are closest to the event that interests you. 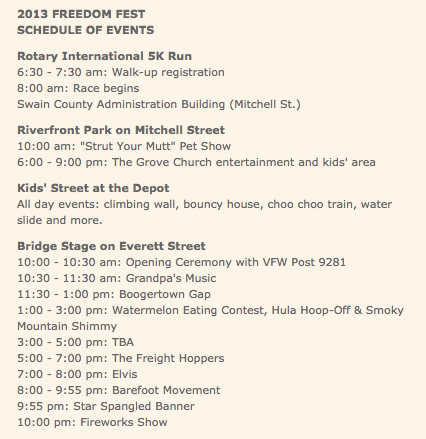 We look forward to these events and assisting you with whatever we can while you are in the area! With the warmer than usual winter it will be time to wet a hook early for some championship bass action on Fontana Lake. This year’s purse is is $5,000 with first place garnering $2,000 in prize money and $1,000 for 2nd place. Prize money will also be awarded for third through eight places and $100 each for the biggest small mouth and large mouth bass. Fontana Village Marina will be hosting the event on their docks located at the west end of Fontana Lake. Celebrating the release of one of their most popular brews, Trail Magic, with live music and more. This will be the 4th Trail Magic Release Party, and will be offering guest the limited edition Russian Imperial Stout that is sure not to disappoint the true Brew-Lover. $5 entry fee and $10,000 in tagged fish! $10,000 in tagged fish in the rivers on the Cherokee Reservation (excluding the 2.2 miles of catch and release waters) Hundreds of specially tagged fish will be stocked in the Cherokee public fishing waters. When a tagged fish is caught it can be redeemed for cash prizes ranging from $20 to $500 based on the color of the tag. Redemption location and times to be announced. Open to all ages and for all legal fishing methods. Registration necessary to redeem cash prize. The Great Smoky Mountains Railroad welcomes back The PEANUTS™ Easter Beagle Express! Trains will depart the historic Bryson City depot and travel along the Tuckasegee River into the quaint town of Dillsboro North Carolina for the 1 ½ hour layover. Passengers will join Snoopy, Lucy, Charlie Brown and our Easter Bunnies for old fashioned Easter fun! Festivities include an on-going Easter egg hunt, crafts, coloring sheets, temporary tattoos, and snacks with Snoopy and more. Recently Added by the Great Smoky Mountains Railroad: Here’s the “Taking Santa Back to the North Pole” train ride! Did you miss the Polar Express ride in November or December leading up to Christmas? You can still enjoy a magical trip with Santa on the Great Smoky Mountains Railroad the week after Christmas. If you will be enjoying your Bryson City or Cherokee vacation cabin rental between December 26 and December 29, you will be in time to keep Santa company on his journey back to the North Pole. The train ride departs from Bryson City’s station, and includes a reading of The Polar Express, hot cocoa and lots of lively songs on its way to the North Pole. Take Santa Claus back home to the North Pole excursions run daily December 26th-29th, at 5pm and 6:30pm. Tickets prices are $26 for kids, $38 for adults, and kids under 2 go free. First class upgrades are always available. 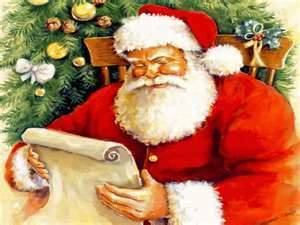 Plus, Santa will visit with each child and give them a special gift of Christmas. There’s a reason why families return every year to ride the Polar Express, now you can experience the magic, too! See what the Polar Express train ride is all about here. Got cabin fever and need to get out for a weekend retreat? 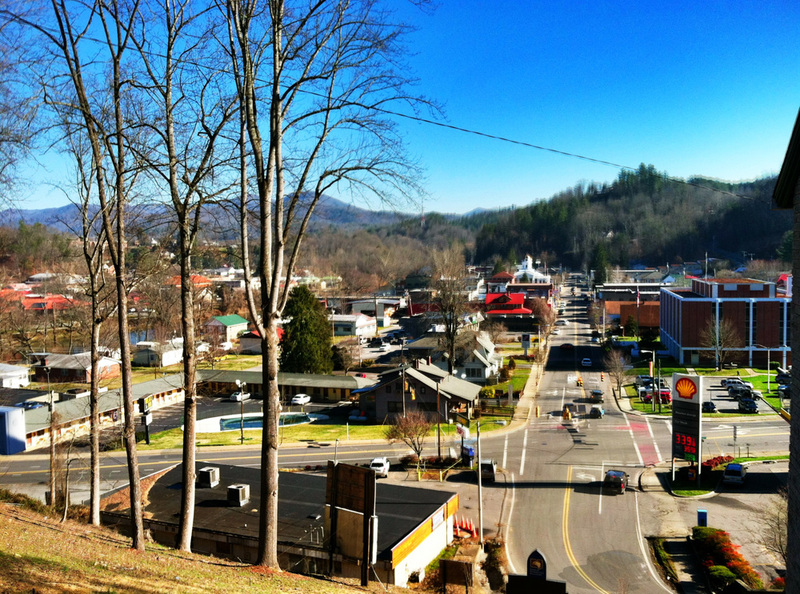 Winter is a great time to visit the mountains, check our current listings of events and concerts for February and March 2012: Area Events, Outdoor Recreation and Activities, and Harrah’s Cherokee Casino Concerts and Events.